The volcanic island of St. Lucia is located in the eastern Caribbean and is known for its dramatic mountains, most notably the Pitons. Running in St. Lucia can be a challenge — there are no long beaches or quiet coastal roads, and the terrain is quite rugged and hilly. Most roads don’t have sidewalks. But there are some decent spots and the views can be gorgeous — be prepared for heat and hills! Rodney Bay/Gros Islet Area. A nice run is in Gros Islet, along Bay Rd., which has a sidewalk, out to Pigeon Island/Fort Rodney, where there are some nice trails, good beaches and great views, for a relatively flat ~6 km out and back. Get the heart rate going with an ascent/descent of the fort. MAP. Reduit Beach Area. Across the inlet from from Gros Islet, run for ~1 km on popular Reduit Beach, and then take the main road south for ~2 km. At the 3.5k mark (Flavours of the Grill restaurant), take a RIGHT, heading west along smaller, quiet, hilly roads to resorts such as Windjammer. Castries Area. Capital of St. Lucia, location of cruise ship terminal. It’s busy here, but you can put together some interesting running. We recommend a ~5k loop from palm-lined Vigie Beach, along Peninsula Rd., out to the Vigie Peninsula and Meadow’s Battery. MAP. In town, one can put together a decent exploratory run on the side streets west of Chausee Rd. Make sure to include leafy Walcott Square, Cathedral of the Immaculate Conception, and King George V Gardens, adjacent to the Central Market. For some quieter road running, there are numerous small roads coming off La Toc Rd., heading south from the ferry terminal toward Mt. Fortune. Create your own route here, but note it is really hilly! 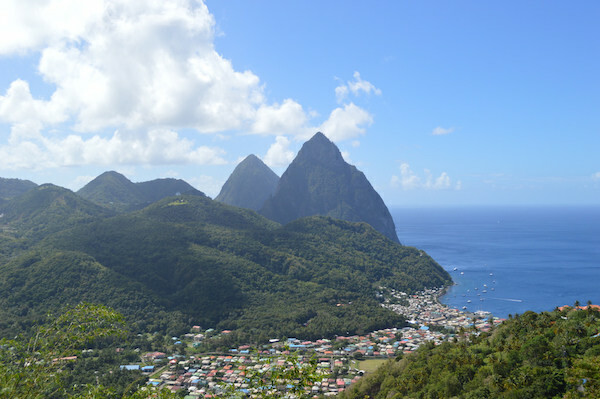 St. Lucia has typical Caribbean weather, influenced by the northeast trade winds. Temperatures are nearly uniform throughout the year, ranging from 20-24C (68-75F) at night to 28-32C (84-90F) by day. There distinct wet (June-November) and dry (December to May) seasons. The interior rain forest receives 2-3x the rainfall as the coast.